Chef belongs to a very rich family which owns many gold mines. Today, he brought N gold coins and decided to form a triangle using these coins. Isn't it strange? He puts 1 coin in the 1st row. then puts 2 coins in the 2nd row. then puts 3 coins in the 3rd row. and so on as shown in the given figure. Chef is interested in forming a triangle with maximum possible height using at most N coins. Can you tell him the maximum possible height of the triangle? The first and the only line of each test case contains an integer N denoting the number of gold coins Chef has. For each test case, output a single line containing an integer corresponding to the maximum possible height of the triangle that Chef can get. Test 1: Chef can't form a triangle with height > 2 as it requires atleast 6 gold coins. Test 2: Chef can't form a triangle with height > 2 as it requires atleast 6 gold coins. 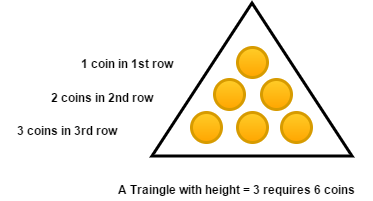 Test 3: Chef can't form a triangle with height > 3 as it requires atleast 10 gold coins.